Gutters are a very important but a frequently overlooked part of a home. They are deceptively easy to forget about until there is a problem. 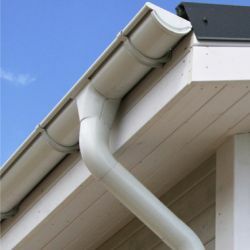 Gutters serve two main purposes. First, and perhaps most significantly, they prevent excess rainwater from making its way to the foundation or basement of a home. Secondly, they prevent a cascade or "waterfall" effect from occurring as rain pours off of the roof. If a building lacks gutters or has poorly functioning or leaky gutters, the results can be disastrous. During a heavy rain storm, a tremendous amount of water is directed right at the foundation of the home by the edge of the roof. While having a long overhang can help somewhat, it often is not enough. The resulting moisture saturation may result in mold and rot. If a home has a basement, flooding may also occur. Repairing a damaged foundation and cleaning up after a basement flood are both difficult and very costly undertakings. Seneca Creek Home Improvement can install an attractive, high quality gutter system that will ensure neither of these issues will affect the homeowner. Unlike some other roofing contractors, Seneca Creek Home Improvement exclusively uses the hidden screw hanger method when installing gutters. Significantly, this means that there will be no risk of the gutters pulling away or separating from the house, even after long periods of time and lots of rain. This is a fairly well-known problem with gutters installed using the older but still common spike system. If separation does occur, not only will the function of the gutters be compromised, but the exterior of the home could be damaged, as well. Seneca Creek Home Improvement can help homeowners residing in the Gaithersburg, Germantown, or Silver Spring areas protect their most valuable investment -- their home -- from the dangers of water damage. A custom designed and professionally installed gutter system from the experts at Seneca Creek Home Improvement is an important and surprisingly affordable way to take care of a house. Once it is installed, the owners will be able to rest easy knowing they can count on their new gutter system to be effective and reliable. A downspout is the part of a gutter system that carries the collected rain water down the side of a home and out onto the ground. It directs the water away from the foundation and/or basement. A downspout is sometimes also called a drain spout, downpipe, or waterspout. FAQ from the roofers at Seneca Creek Home Improvement: What makes seamless gutters superior to sectional gutters? As their name implies, seamless gutters are all one piece: they don't have any breaks or seams. In comparison, traditional sectional gutter systems are composed of lots of individual parts that are connected together. Seamless gutters are much less likely to develop leaks. This means they can be counted on to provide a long life of worry-free, dependable service, without the need for frequent maintenance or repairs. In addition, most people agree that seamless gutters are much more aesthetically pleasing. Seneca Creek Home Improvement is a GAF Master Elite roofing contractor in Maryland.